Secure access to your applications and data, no matter where your users are - on any device - from anywhere. For organizations of all sizes, Duo’s trusted access solution creates trust in users, devices and the applications they access. Reduce the risk of a data breach and ensure trusted access to sensitive data. Verify the identity of all users with Duo's strong two-factor authentication. Check that your users' devices meet your security standards before granting them access. Set policies to grant or block access attempts by user or device, based on contextual factors. Seamless and secure access to cloud and on-premises applications and servers. Make sure your users are who they say they are. Verify users' identities with Duo's strong two-factor authentication - before granting access to applications - to protect against phishing and other access threats. This is the first step toward a zero-trust security platform. After verifying user identities, Duo checks that their devices meet your security standards - safeguarding against vulnerable or compromised endpoints. Regain insight and control over managed and unmanaged devices, before they access your applications. Designed for the best user experience, Duo empowers your users to quickly and securely access applications without adding friction to their workflow. It's also easy for your admins with our low-touch deployment and solution maintenance. We chose Duo for its ease of use, rapid deployment and out-of-the-box integrations. No matter what IT or security vendors you use, Duo lets you secure access to all applications, for all users, from anywhere with Duo's trusted access solution. We deliver the building blocks in one solution, giving you the flexibility to deploy them at your own pace. [Rolling out Duo] allowed me to own security. All of the insight it gives you, all of the control, how granular the access policies are. It really makes you the owner of security, regardless of what role you’re in. Reduce the time and resources required to secure your environment with Duo's centralized security platform. Consolidate and simplify your security portfolio while realizing faster time-to-security with the value of Duo's trusted access solution. To help large enterprises stay ahead, Duo's trusted access provides a high-availability service strategically designed with future-proofing, extensibility, risk reduction and scalability in mind. 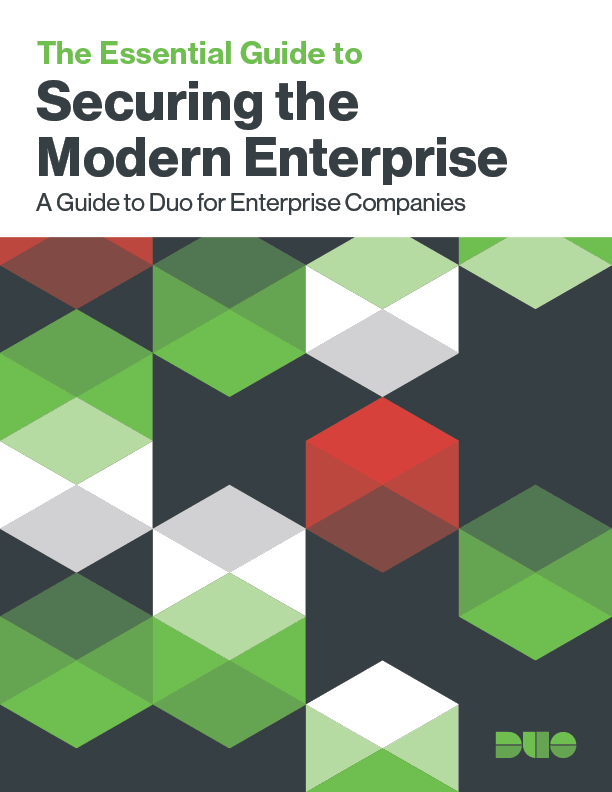 Read Securing the Modern Enterprise: A Guide to Duo for Enterprise Companies to learn more.